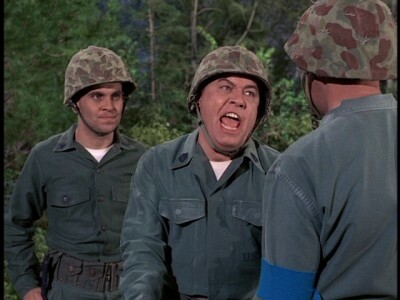 Reviewer's Note: Way back in 2006, I began reviewing the first four seasons of Gomer Pyle, U.S.M.C. for DVDTalk. So, for this new complete series set, I'll combine some of those older reviews with new observations and information about this release. Shazam! 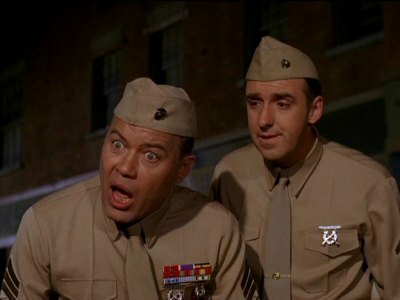 CBS DVD and Paramount have released Gomer Pyle, U.S.M.C. : The Complete Series, a single volume, 24-disc collection of the CBS smash-hit sitcom that ruled the Nielsens during its 1964-1969 run. Starring Jim Nabors and Frank Sutton (one of television's most accomplished, and least appreciated, comedy teams), Gomer Pyle, U.S.M.C. absolutely enraged elitist "television critics" and baffled bitter social commentators who lamented the series' massive popularity as a sure sign that 1960s TV was a cultural wasteland of science-fiction, fantasy, and hillbilly junk, aimed at the lowest common denominator. Affording these helpful purveyors of aesthetic tastes their proper due respect, tens of millions of weekly viewers in "fly-over" country promptly sounded a Bronx cheer to their "betters," and went right back to enjoying the silly, sweet (and beautifully executed) antics of Private Pyle and Sergeant Carter, in the process making Gomer Pyle, U.S.M.C. a truly iconic comedy series that survives to this day in syndication, and with good reason: it's funny as hell. I didn't see anything new here in terms of transfers or extras, compared to earlier single season DVD releases of Gomer Pyle, U.S.M.C. (the extras all come on season one), so if you have those sets already, there's no need to double dip. However, anyone new to the show (as well as those fans of its host series, The Andy Griffith Show) will want this set. Got that, you knuckle-headed, goldbricking goof-offs? 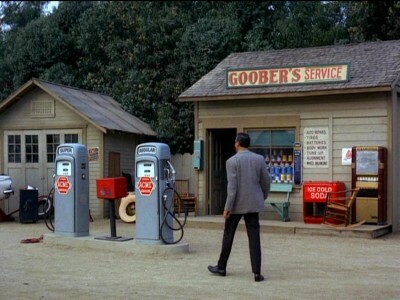 On the last broadcast episode of the 1964 season of The Andy Griffith Show, gas station attendant Gomer Pyle (Jim Nabors) marched into Sheriff Andy Taylor's (Andy Griffith) Mayberry office, singing the Marine Corps hymn, and announced that he had just signed up for active duty. Having co-starred on The Andy Griffith Show for only a year and a half, it was quite a coup for the multi-talented Nabors to be given his own starring vehicle--particularly one with such an impressive pedigree and potential for success. Originally intended for George Lindsay (who would go on to play Goober Pyle, Gomer's nephew, on the Griffith show), the Gomer Pyle, U.S.M.C. spin-off series was the idea of Aaron Rubin, a veteran of TV comedy (it's important to note here, though, that legendary scripters Everett Greenbaum and Jim Fritzell are credited with creating the "Gomer Pyle" character for The Andy Griffith Show). Rubin had worked as a writer for the classic military service comedy, The Phil Silvers Show, as well as being a producer, writer and story consultant for the enormously popular The Andy Griffith Show. Along with Andy Griffith (who gets an "Associated with" credit at the end of each Gomer Pyle, U.S.M.C. episode), Rubin's premise took the bumbling, country yokel with the heart of gold, and stuck him into the toughest military outfit in the world, matching Pyle up with the meanest, loudest drill instructor they could find: Gunnery Sergeant Vince Carter (Frank Sutton). A pilot was shot, featuring Sheriff Taylor taking Gomer to his induction, while helping Gomer through the first few hours of his boot camp. That fall, Gomer Pyle, U.S.M.C. premiered, and was an immediate smash hit with viewers (at least according to the Nielsens), ranking third overall in the 1964-1965 ratings, even beating out its original host series (an event, according to some insiders, that apparently rankled Andy Griffith, when Nabors undiplomatically crowed about beating his old series). During its five year prime-time run, Gomer Pyle, U.S.M.C. never left the Nielsen Top Ten--a considerable accomplishment for a sitcom. 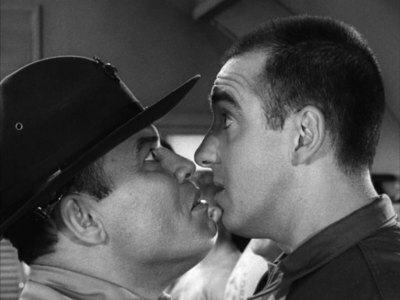 Considering its intimate connection with one of the most beloved, iconic sitcoms in television history, it's too bad that Gomer Pyle, U.S.M.C. has never received the kind of fan adoration or critical scholarship that's been afforded its host series, The Andy Griffith Show. Equally popular with viewers during its original run, it has lasted for decades in syndication all over the world, just like The Andy Griffith Show. Gomer Pyle, U.S.M.C. features one of that show's most popular reoccurring characters, supported by most of the creative talent that went into making The Andy Griffith Show a pop culture phenomenon. While I would guess one of the big reasons Gomer Pyle, U.S.M.C. 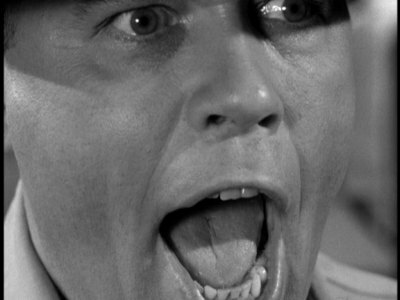 never achieved any kind of cult following was the show's own limited format (no insular "universe" populated by eccentrics, such as Mayberry, is created), certainly as big a stumbling block was the (unfair) initial and seemingly enduring critical reaction to the Gomer Pyle character, dimming the series' chances at later appreciation. The Andy Griffith Show was well-liked by the critics during its original broadcast run, but they didn't think it was the masterpiece that everybody considers it now. And when Gomer Pyle, U.S.M.C. premiered, those same critics were far less kind. Something about the over-enthusiastic, slow-on-the-uptake Gomer going through the slapstick motions of Marine basic training, rubbed the urban, elitist critics the wrong way, provoking a disdain for the show and the character that quickly made even the mere mention of the series' name a punch line for comedians and talk show hosts who wanted a cheap laugh (Carson used it for years as a reliable laugh-getter). Despite its enormous popular success, Gomer Pyle, U.S.M.C. was never nominated for an Emmy, another good indication of how it was taken for granted in an industry that could barely contain its disdain for anything Southern or rural. Viewed today, Gomer Pyle, U.S.M.C. comes off extremely well compared to its ignominious reputation. First and foremost, it accomplishes what it sets out to do: it's funny. That may seem simplistic praise, but creating a comedy show that gets laughs over forty years later is no small accomplishment, considering the changes in time and taste. 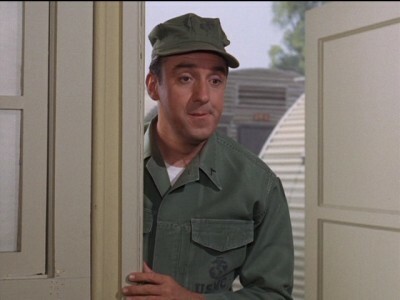 You have to hand it to Jim Nabors; he is paralyzingly funny as Gomer Pyle. Comedy of course is subjective; what strikes one person as hilarious can cause teeth-grinding with another (Jerry Lewis would be the acid test for that theory...and you know where I stand with that genius). So it's difficult to bring somebody over from the "other side". Either you find Nabors funny as Gomer, or you don't. I do. Enacting a character such as Gomer, a totally pure, naive, optimistic, good-hearted personality, who also happens to be a slow "country bumpkin," takes a complete commitment by the actor, a willingness to be 100% honest in his portrayal, while being "in the moment" and at one with the character, at all times on the screen. Otherwise, the character becomes a cartoon; we never really believe in him as a whole person. While critics then and now may suggest that's precisely what Gomer was--a grotesque cartoon characterization--I find that not to be the case at all. Nabors is quite adept at making Gomer a believable human being, with faults and a range of emotions that result in quite an endearing, likeable character. Nabors may state in one of the episodes' commentaries here that's he's not a great actor (he had never acted before taking on the role for Griffith), but perhaps what he meant was that he's not a traditionally-trained actor. Creating a character such as Gomer Pyle, whom people remember and still seek out fifty years later, is nothing to sneeze at for any actor, regardless of their training or pedigree. Of course, you can't have such a sweet character like Gomer in a show without a comedic foil, a counterbalance, and Gomer Pyle, U.S.M.C. found a brilliant one in the guise of Frank Sutton's Gunnery Sergeant Vince Carter. 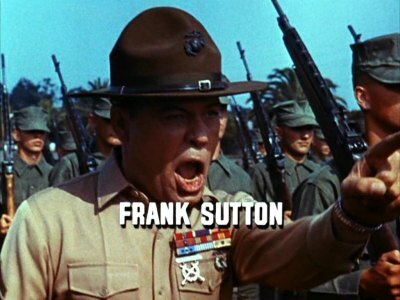 Unlike Nabors, Sutton was a classically trained actor prior to this TV assignment, and as hot-headed Sgt. Carter his is letter perfect. 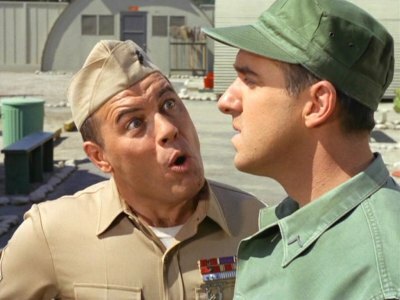 I can't imagine a tougher assignment for an actor than Sutton's basic responsibility in Gomer Pyle, U.S.M.C. : blow up at Pyle each time he screws up. But somehow, particularly in the first season when Sgt. Carter is at his most adversarial with Pyle, Sutton manages to bring a new spin to each of his patented explosion scenes, doing a slow burn better than just about anybody in the business. There's something about the absolute insanity of his rage, the savage anger in his face and voice, that makes Sutton's chewing out of Nabors surprisingly riveting...and fall-down funny. Again, if that was all Sutton had to do, he'd be a cartoon, as well. But he manages to bring subtleties to the role, as well; all one has to do is watch his alert, bright eyes to see that this is an extremely skilled actor listening, watching, and reacting to Nabors, in perfect synch. He's totally in the moment and in the character, just like Nabors. They're a justifiably famous TV comedy team, with a chemistry together that is rare (and the crime is, you never hear their names mentioned when the great comedy teams of television are listed or discussed). Gomer Pyle, U.S.M.C. 's framework, both thematically and visually, is a bit more rigidly structured than its host series, The Andy Griffith Show, with Gomer and Sgt. Carter sticking close to that claustrophobic barracks for much of the series. However, it's really no different from most successful TV series in the 1960s, when the networks strived for a reliably repeatable experience for its mainstream audiences. Gomer Pyle, U.S.M.C. utilizes the same four or five basic sets (the men's barracks, Sgt. Carter's barracks, the small area outside the barracks, and then pick-up shots in various anonymous bars, lobbies, stores and other buildings--all from the famous "Forty Acres" lot), to create a visual continuity that varies very little from episode to episode, season to season. Camerawork is restricted to the same master shot, two-shot, over-the-shoulder P.O.V., and close-up technique that marks most televised shows from this era, and background mise-en-scene is limited to the barest essentials (that set dresser couldn't have been too busy). What we have, then, is a regimented visual field created strictly to showcase the actor delivering the screenwriter's dialogue. Now some TV critics detest such rigidity, seeing it as artistic non-growth. But that view doesn't take into account the honing of the performances that occurs when actors, particularly in a sitcom, have the chance to perfect their timing and delivery over a period of years, within a stable framework. 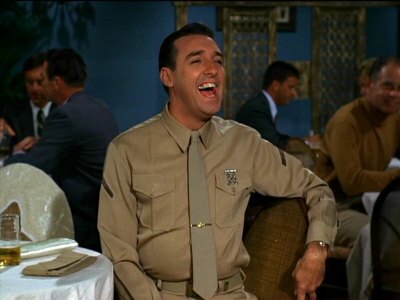 And with Gomer Pyle, U.S.M.C., the scripts, while at times perhaps too "sitcom-y" for some more fussy modern tastes, deliver solid, dependable laughs time and time again, due largely to the expert mugging of Jim Nabors and Frank Sutton. With the series under the steady guidance of creators Aaron Rubin and Sheldon Leonard, it deviates little from its locked-down premise; week after week, Sutton and Nabors are able to cruise along with these silly little 25-minute farces with supreme ease, finding endless variations on line deliveries and facial expressions that never cease to amuse. The characterizations, and then subsequently the comedic dynamics, did subtly change over the five seasons, though. After all, there had to be some growth; you couldn't just have Carter yelling at Pyle for his umpteenth foul-up for 150 episodes. 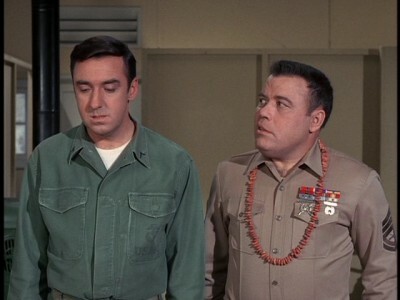 As the series progressed, Carter became more of an overt friend to Gomer, while Gomer became much more competent in his duties. You can already see the progression the series would take right in the first season, when Carter, despite his hatred for Pyle's disorganization, comes to realize that Pyle is a hard worker and a good soul. Slowly but surely, Gomer's and Carter's relationship moves closer towards friendship, rather than strictly a D.I. and his recruit. Gomer of course considers Carter his true friend; that dynamic never wavers, and provides plenty of the comedy (and pathos) whenever Carter balls out Gomer (and feels guilty about it later). Carter begins to realize that he has to deal with Gomer, regardless of how he feels about him, and a grudging, growing kind of tolerance (or at least acceptance) for Gomer's screw-ups, settles in, before they become full-blown pals, hanging out together during free time, and even double-dating. Those love lives of Gomer's and Carter's gets a boost during the fourth season, when the series spends a bit more time with the boys' relationships with girlfriends Lou-Ann Poovie (Elizabeth MacRae) and Bunny Wilson (Barbara Stuart). 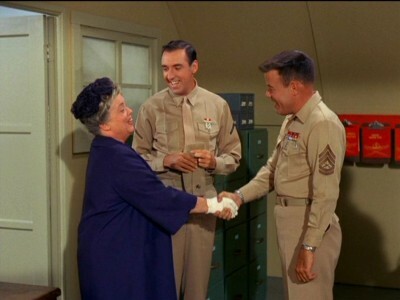 The hijinks centered around the barracks and "peacetime" military life on a Marine base (at least it was peacetime according to CBS) are still here, but more traditional sitcom romance plot lines eventually creep in. Sergeant Carter has the overtly "funny" relationship with the experienced Bunny. Ever fearful of total commitment, Carter's misadventures with his long-term girlfriend are usually predicated on his stretching the truth, or ignoring her feelings outright, until he comes around and realizes he has it pretty good with the understanding Bunny. Gomer's love life (now there's something to ponder), nonexistent during the early seasons, seems to be steady and solid as the series wound down. What, exactly, the nature of that relationship is, though, is anybody's guess. "Chaste" wouldn't even begin to describe Nabors' pursuit of MacRae--in fact, "pursuit" is too strong a word, as well. The screenwriters have the unenviable task of maturing Gomer through the series (he's doing rather well on base by the last two seasons), while still trying to keep him an innocent from Mayberry, going blithely through the world, oblivious to its sophistications. 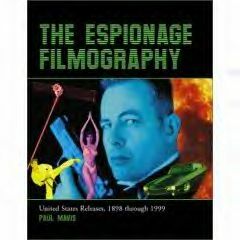 So how do you have a character be a Marine (not exactly a sexually reticent occupation, according to decades of stereotypes in movies and TV), with a steady, gorgeous girlfriend, and evidently a fistful of nightly passes (he does seem to go off base quite a bit), and yet still keep him a virgin? Or is he a virgin? 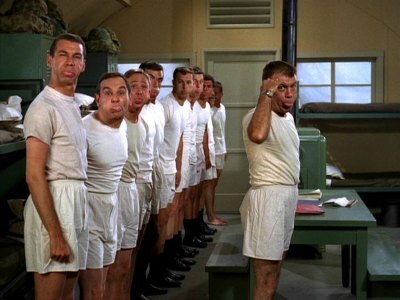 Gomer's sexuality is necessarily vague because the minute the audience sees Gomer as a sexually active man--not just a sexually active man but a Marine, for god's sake--his innocence, and the show's, is lost. So dinners at the cafe, and movies, and snuggling on the couch are about the only action we're going to see here between Gomer and Lou-Ann. 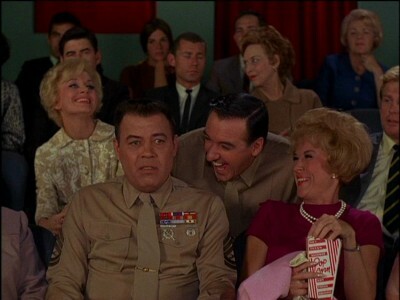 When Gomer finds himself going to a drive-in movie with guest star Carol Burnett as Corporal Carol in a season four outing, he's oblivious to Carol's expectations that he "perform." Looking at a nearby couple making out, Gomer says, with genuine wonder, "They're missing the best part of the cartoon." That's sweet, innocent, naive Gomer, through and through. And of course, the simple, "country" ethics of the show (brought over from The Andy Griffith Show) are on display throughout the series, with the same message hammered home episode after episode: good-natured, good-humored, thoroughly honest Gomer will win out every single time over someone--usually Sergeant Carter--who is dishonest in either their actions or, more importantly, their true feelings. 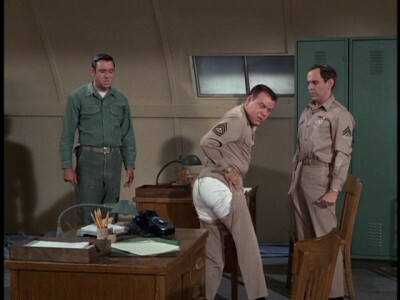 A big source of the comedy in Gomer Pyle, U.S.M.C. is watching Carter expend a terrific amount of energy trying to suppress Gomer's goodness (telling him he's naive, trying to get him to be less conscientious because he goes overboard), only to admit defeat and understand, in the end, that Gomer was right all along. It was better to be honest and truthful. And good. 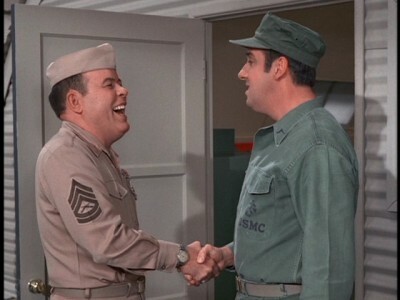 If Gomer Pyle, U.S.M.C. has an identifiable central theme, it might be best described as: Gomer's seemingly simple-minded ideals may be old-fashioned and even comical, but they're still the best way to live one's life. Quite a few critics, then and now however, saw the show differently, reserving a special level of scorn for it because Gomer Pyle, U.S.M.C. failed, in their minds, to be "honest" about Vietnam. After all: how could a TV series, set on a Marine base in contemporary late 1960s America, not mention Vietnam? Of course that's a ridiculous complaint for an entertainment show that was in no way designed to be socially or politically relevant. What were the producers of the series supposed to do--turn Gomer Pyle, U.S.M.C. into a hard-hitting, fact-based docu-drama to satisfy some self-important, faux-outraged critics? The public was well aware of what was going on in Vietnam; they saw it every night on their national news, and every week big and small towns all across the country welcomed home their fallen soldiers for the last time. Did those viewers need Gomer Pyle, U.S.M.C., of all shows, to give them further elucidations on that awful war? Those critics couldn't see the simplicity of the transaction the show offered to the public? Just for one half hour every Friday night: a reassuring respite from the horrors of that all too real war (and please don't insult me by emailing that it unfairly enticed kids to join up--what kid didn't know this was all fantasy? TV viewers have always been way smarter than critics allow)? 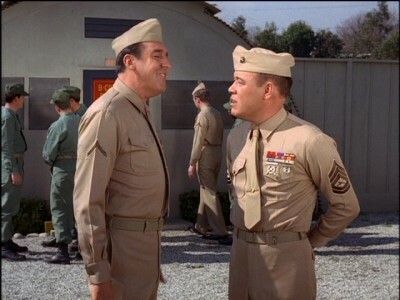 Yes, it was a fantasy version of Marine life, but in its own way, within in its own fictional boundaries, a valid one, since Gomer never actually went off to war (CBS demanded that Pyle never be deployed into action, lest the realities of the world intrude on the fantasy land of Gomer's and Carter's Marine life--such as the tragic reality that a number of those young men seen marching with Jim Nabors in the opening credits, would later fall in battle overseas). Gomer Pyle, U.S.M.C. never claimed to be anything but an entertaining service comedy, and at this, it expertly succeeded. If it failed to reflect the reality of its context outside the domain of its small, square TV box, it did so deliberately for the sake of its weary, increasingly set-upon audience...and not because it was too dumb to see what was going on over in Asia. If you're the type that sneers at something like Gomer Pyle, U.S.M.C. because it didn't try and "teach" its audience something--because you think real "art" is transformative and "entertainment" is ultimately meaningless--I would direct you to the gallery where Picasso's shattering anti-war painting, Guernica, now hangs, having previously toured the world where millions of people viewed it over the decades. It's certainly "art" with a message and an intent to teach and warn...and it hasn't stopped one war, as far as I can tally. So why should something like Gomer Pyle, U.S.M.C. be attacked for doing no more or less? In the fifth season episode Flower Power, from Bill Idelson and Harvey Miller, Gomer has to camouflage a communications truck for a big-scale exercise. Enter three hippies, including The Committee's Rob Reiner and Leigh French, who can't understand why Marine Gomer's truck is choking off the sunlight to all those pretty daisies. In a sweetly-written little scene, Gomer and the hippies get to know each other, with some amusing asides about materialism, before they all sing Dylan's protest song, Blowin' in the Wind. Gomer Pyle, U.S.M.C. 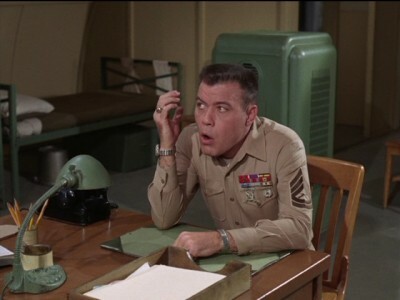 's producers may have been forbidden by the network to discuss Vietnam, but even the most casual, apolitical viewer of the show back in '69 would have paused, and understood exactly what was what, when the camera does a one-shot of Nabors, in uniform, singing, "how many deaths will it take, till he knows that too many people have died?" It was as understated-yet-clear a message as the last shot of Gomer Pyle, U.S.M.C.. In the final episode, Goodbye Camp Henderson, Hello Sergeant Carter, when Sgt. Carter, relieved that Pyle won't be transferred out of his command, shakes his true friend Gomer's hand...he realizes they're stuck together permanently: Gomer was lacquering the Sgt. 's chair. It's a fitting final image for one of television's most accomplished comedy teams, in one of the best sitcoms of the 1960s. As I wrote in my previous reviews, it's entirely possible that episodes have been edited for content (in seasons 2-4), most likely for musical numbers that Nabors sings for which CBS couldn't (or wouldn't) get legal releases. Most episodes do run at least 25 minutes, so...it's up to you if this is a deal breaker (life's too short: don't hold your breath that anyone is going to pony up exorbitant amounts of money for song releases when this entire series set is selling for less than $40 dollars on Amazon--art aside, the profit margin for a set like this simply doesn't warrant that expenditure). Otherwise: the fullscreen, 1.37:1 black and white (season one)/color (seasons 2-5) transfers look very good. Image detail is pretty sharp, color isn't bad (perhaps a bit off in values, due to age), contrast is fine, and screen imperfections are at expected levels. The Dolby Digital English mono audio tracks are fine, with very low hiss and a decent re-recording level. English closed-captions are available. 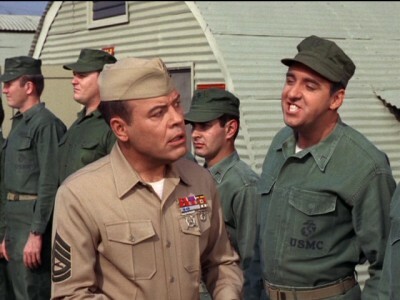 The extras here, are the same ones from the season one release of Gomer Pyle, U.S.M.C., back in 2006, including audio intros for that season's episodes from Nabors. On disc one, the pilot episode for Gomer Pyle, U.S.M.C., from The Andy Griffith Show, is included. It's essential viewing to see the transition from Mayberry to the Marines. The disc producers have also included the rare black-and-white sales promotion pitch bumpers for the pilot, performed by Nabors. As well, Nabors offers an interesting audio commentary for this pilot episode. 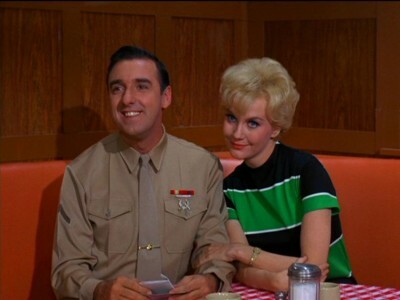 Nabors also provides an audio commentary for the premiere episode of Gomer Pyle, U.S.M.C.. Nabors has lots of stories to tell about the show, as well as emphasizing his well-known affection and respect for the Marine Corps. Nabors comes across extremely well here (he doesn't sound a day older than Gomer from forty years ago), offering an extremely heart-felt, sincere thank you to his fans at the end of the commentary. On disc two, there's another interesting commentary from Ronnie Schell, who played Duke on the series. A friend of Nabors, Schell also sounds exactly the same, and he has a wealth of information packed into a short 25 minute commentary. It's a shame we couldn't hear more from these two gifted actors. Disc two also has a short color clip from The Lucy Show, which features Nabors at the very end (it's more loud than funny). On disc three, there's an undated, 11 minute interview with Nabors, conducted by British TV personality, David Frost. It's a quick, but interesting look at Nabors relaxing outside of his Gomer Pyle persona. 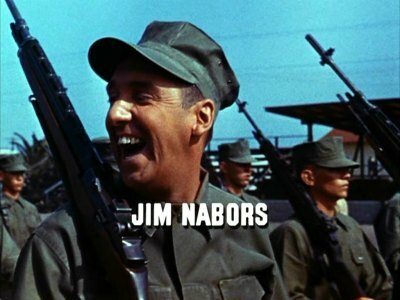 And on disc five, there's a short 9 minute clip from The Jim Nabors Hour, Nabor's CBS variety show that followed the Gomer Pyle run. The clip features a skit entitled The Brothers-in-Law, and features Frank Sutton and Ronnie Schell, as well. Most alarming is watching Frank Sutton breathing so heavily during the skit; it's not surprising when you hear Schell, in his previous commentary, recount how Sutton smoked 18 Brazilian cigars a day. Other than that: no new extras. Surprise! Surprise! Surprise!--Gomer Pyle, U.S.M.C. is one of the best sitcoms of the 1960s...no matter what the snooty critics, then or now, say. Gomer Pyle, U.S.M.C. never received the critical respect it deserved during its day. Perhaps Jim Nabors was too good portraying the "knuckle headed, goldbricking, goof-off" country boy Pyle; perhaps critics thought he wasn't really acting. Or maybe it was the fact that the show offered simple pleasures to loyal fans, executed by total professionals who didn't care if the critics liked them or not. And loyal fans they were; in that neglected "fly-over" country between New York and L.A., Jim Nabors was a TV superstar, and Gomer Pyle, U.S.M.C. quickly became a pop culture sensation, as well as one of the highest-rated TV programs of the 1960s. Sharp, funny writing from the same production team of that masterpiece of the 1960s sitcom genre, The Andy Griffith Show, and the inspired team of Jim Nabors and Frank Sutton--a brilliant duo--make Gomer Pyle, U.S.M.C. must viewing for fans of TV comedy. 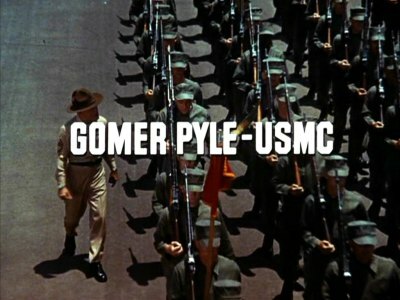 I'm highly, highly recommending Gomer Pyle, U.S.M.C. : The Complete Series.